Active in companion animal rescue for over a decade amd a ja;f, primarily with Great Danes and hounds, but also Malamutes, Rhodesian Ridgebacks, Lacys and other medium-to-large breeds. Founder of a coalition of scenthound rescuers covering the state of Texas and southern Oklahoma. Moderator of a nationwide American Foxhound rescue e-mail group. Former board member of the Alamo Great Dane Club. Jerry and his wife, Linda, have trained Great Danes and scenthounds for AKC Obedience competition and APDT Rally-O competition. Two of their rescue Great Danes have been nationally ranked in AKC Obedience, one winning the top placement (called High in Trial) at the 2003 Great Dane National Specialty in Orlando with Linda handling. Linda has also been a substitute trainer for Austin Canine Central. Jerry and Linda live with 3 cats, a Great Dane and 2 coonhounds in southern Williamson County, Texas. I became a foxhound devotee during my total of about 15 years of mounted foxhunting (more accurately, foxchasing). During my latest experience with a foxhunt club here in rural central Virginia I was privileged to get to work closely with the pack of hounds which, in this club’s case, numbered about 40. I came to know every hound by name, temperament, and in some cases that hound’s role in the pack while hunting. With a number of the hounds in the pack, this began with their birth at my home in a cozy stall in the barn – six litters in all. I was a witness to every birth and watched them develop their personalities as they grew, until they left to go back to the hunt kennels at about 10 weeks of age. Foxhounds in mounted foxhunt packs usually “enter” (become members) of the pack at around 1 year of age. Prior to this time they are introduced to the pack by “walking out” with it along with the huntsman and several of his or her staff members. The younger hounds learn what is expected from them from the older, wiser hounds and from the humans in charge of them. I participated in walking out religiously; it was something I absolutely loved. I was privileged to ride (with about 15 other riders) behind this hunt’s pack for 7 years, over hill and dale and at sometimes very fast speeds to keep up with them as they chased the fox. It was an experience without parallel, especially watching the hounds doing what they have been bred to do for centuries. I am the proud owner of two foxhounds (please see blog post “Tips on Adopting a Foxhound”) named Corporal and Walden. Walden was the runt of a hunt litter born here and too small for hunting. Corporal, however, chased foxes for 6 years, acquitting himself nobly. They are part of a pack of four in our household joined by brother and sister Chow/retriever mixes adopted from a nearby shelter. I continue to follow the hounds of another nearby foxhunt but this time in a truck (this is called “truck hunting”). To keep up we traverse farm roads on the farms the hunt is riding through and also the local country roads. I am lucky enough to ride with a former head and huntsman of yet a third local foxhunt, a man who knows more about foxhounds and fox chasing than I will ever learn. I am also a volunteer dog walker at our local no-kill county shelter and have rescued 7 foxhounds from kill shelters in North Carolina. In 2013, after being without pets for more than 20 years, I impulsively adopted a high-strung and freaked out young Treeing Walker Coonhound. I named her Hattie, and my hound education began. After a great deal of research, a six-session obedience class, and hundreds of miles together on trails and sidewalks, we both started calming down. Almost two years later I adopted Cora, a young tricolor American English Coonhound, and started learning about multidog households. Both hounds are sweet, smart, affectionate, and comical; but their temperaments are a challenging mismatch. Hattie is intense and independent; Cora is calm but anxious and wants to control Hattie. As Cora reached full maturity, her behavior toward Hattie shifted from adolescent brattiness to actual aggression. So my advanced study topics became resource guarding and managing inter-dog conflict. Addressing the relationship problems between them has been good training for all of us. I’m a more deliberate and exacting dog owner; and my hounds have grown in confidence, focus, and self-control. Hattie and Cora enjoy nosework and rally obedience and do their very best to keep varmints out of the yard. Over the past few years they’ve also tolerated and sometimes actually mentored short-term fosters for Texas Cattle Dog Rescue. It doesn’t take long after getting involved in showing and training purebred dogs that you get “suckered” in to rescue. It takes even less time when you spend hours every year training in animal behavior. And even less time when you work professionally in an animal shelter and have an incredible love for four legged critters. I’ve owned Shelties, Labs, Weimaraners, and Coonhounds and shown them all in various venues including conformation, tracking, agility, obedience, field trials, hunt tests and more so I was ripe for a lot of suckering. I’ve fostered hundreds of dogs at my home and helped to transport and place them in to loving homes. To reduce the overpopulation and the dumping of animals at shelters and rescues by sharing the beauty of each animal's individual persona with the world. If people can be taught to treasure each animal for its personality, whether it’s wild, feral or domestic, whether couch potato or chained, mutt or champion; perhaps then people won't be so quick to abandon, abuse or neglect the lives of the animals around them. My mission is to share my "tricks of the trade." To teach people ways to better the lives of their pets and to better the lives of the pet owners through behavior modification and training. Each pet I've owned has shared new lessons with me. I wish to share those gifts with as many people as I can. To prevent life's hard knocks through shared knowledge. I realized this after I noticed that the rescued animals that most upset me were the ones that were the easiest to train. These ones often came into the shelter with a bad habit, but it was incredibly easy to fix it. Instead of being relieved at the ease of the solution, I was doubly mad that the owners hadn't handled it themselves. It's easy to understand when a tough to train animal is turned over to the pros. It's hard to understand when the easy ones are dumped. Perhaps that's a message I need to understand. The ones that seem easy to me to fix must have seemed impossible to live with to the person who dumped their problem on to the shelter. May I find a way to intercede. This phenomenal project helps me live my mission statement and it helps me to share my love for some of the greatest pets I’ve ever owned, fostered or handled---long eared, song filled galoots otherwise known as coonhounds! One spring evening in 2004 while researching something for the shelter where I have long volunteered, I stumbled upon a news release about Sunbear and the sentencing of his owner on the website of the Humane Society of the United States. His haunting eyes in the photo taken while he lay in the shallow creek bed immediately and permanently lodged into my heart and mind. My life has never been the same. I resolved to learn more about Sunbear and Gene Fields, the Animal Control Officer who worked so long to bring Sunbear's owner to justice, so I tracked Gene down and contacted him. We talked many times over the phone. Gene told me that the saddest part of his job was finding that neighbors frequently did not call law enforcement when they observed an animal being neglected or abused. He told me many tragic stories that could have had very different outcomes if only neighbors would have taken some action. Those conversations planted the idea for a web site to educate and encourage people everywhere to do the right thing when finding an animal in distress. The web site launched in January of 2005. In the past half dozen years, I've become fairly obsessed with coonhounds and foxhounds. Austin, our adopted Treeing Walker Coonhound, now passed over, inspired me and my husband to support this new Coonhound Companion effort. Austin is a soulful and sweet companion. When I'm feeling down, he always notices and wants to comfort me. He has a funny side too; we call him our "spazzy boy" when he stomps excitedly in little circles to earn a treat. I took him to Bark in the Park last summer and he sang SOOOOO EAGERLY and LOUDLY that the microphone stayed right over his head! When I asked him to stop, he did. We were surrounded by amazed laughter; it was so much fun. Everyone had to pet him and admire him. We love him so much and want to share our appreciation for that great American dog, the coonhound. Emily S. Plishner has two pet redbones, Clamour and Mudd. They split their time between Brooklyn, NY and the Catskill high peaks where they wander the mountains and chase raccoons, bobcats and bear up trees, then go home to share meals and the bed with Emily and her husband, Mitch. In the city, the hounds walk nicely on leash and attract huge amounts of attention, especially from children who have read "Where the Red Fern Grows" or seen one of the movie versions. Emily and the hounds participate in United Kennel Club competitive coonhound events. Clamour, 6, is a Grand Field Champion and Mudd, 5, is a Grand Show Champion, Grand Water Champion, and Field Champion. Emily also has a NY hunting license to train her hounds on bear, responding to calls from citizens to help chase bears out of areas where they are unwelcome, such as summer camps, cornfields, and orchards. She is the secretary of the Sullivan County (NY) Coonhound Association, the Zone 4 representative of the NY Houndsmen Conservation Association, and a columnist for that group in "American Cooner," "Full Cry," "Hunter's Horn" and "Rabbit Hunter" magazines. She is a member of both the National Redbone Coonhound Association and the American Redbone Coonhound Association. 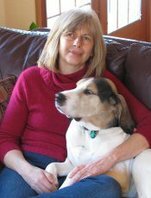 She writes a column for the national association in "American Cooner" magazine, and posts regularly on several internet coonhound boards, including the UKC coonhound and redbone boards, the Shade Tree Big Game and Coonhound forum, The Yahoo Pet Redbones and Coonhound Fanciers boards, and KC's Hounds and Houndsmen forum. I have volunteered with St. Francis Animal Rescue, CARES and Take the Lead Rescue in Minnesota. I've worked at adoption days, done transporting, fostering and fundraising. Boone, a bluetick coonhound, my family fostered was my first experience with coonhounds. Boone had been abused and was quite skittish, but I loved his gentle nature and spirit. He was adopted after 9 months in our home but I never lost my desire for having another coonhound. Enter Wanda, a Treeing Walker Coonhound. I found her on Petfinder and she was a special needs dog because of her skin and ear problems. She had been at the shelter for 9 months and at one time had scratched almost all her fur away. Wanda had an advocate, Anna Nirva, a volunteer at the Vernon County Humane Society in Viroqua, Wisconsin, Anna even made Wanda food in her home and brought it to the shelter. We adopted Wanda in August of 2008 and Anna became my friend. She asked me if I would like to be a board member of Sunbear Squad. 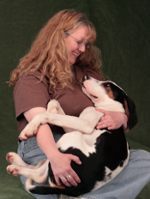 Then in early 2012 I became the coordinator of Coonhound Companion's Long Ears Alive! Program to help coonhounds in shelters of pounds with medical issues that would deter their rescue or adoption. Many coonhounds have received donations for heartworm treatment, surgery (eye removal, cherry eye), tumor/growth removal, medical visits to determine illness or injury, etc. It is very rewarding to be involved in this program to help Coonhound Companions make a difference in a coonhound's chances of getting out of a shelter or pound alive. I remember the first time I saw a picture of a Bluetick Coonhound, I thought that this was the most beautiful dog I had ever seen. I vowed one day that I was going to have one of my own. After our first dog Max, passed away at almost 15 years of age (he was a pointer/lab mix), I set out to try and find a new companion, and it was going to be a Bluetick Coonhound. After searching and contacting various people through the internet, I found my boy Jake from a breeder who also hunted his dogs. Well Jake just wouldn’t have any part of hunting. He wanted to be with his people and none of that nonsense of running in the bush at night chasing raccoons. In fact, he didn't like the rain or getting his feet wet. So long as he was with us and near a food bowl, he was the happiest hound alive! I remember bringing home this huge 1 ½ year old, lanky, big dog and thought “oh my god, what have I done!” But after a couple of days with our new boy I knew he was exactly what I was looking for and he was here to stay. He was an amazing, kind-hearted, lovable, goofy boy who gave me almost 14 years of companionship and love. He was such a special boy he inspired me to want to help more wonderful coonhounds find forever homes. The rescue was started in 2003 and we have saved over 150 coonhounds and bloodhounds. We have two dedicated volunteers, and we spend many tireless hours trying to find foster homes for a homeless hound. We could not do this without our very special foster homes and volunteers. We are the only Coonhound Rescue in Ontario, Canada. My husband and I have three other very special Bluetick Coonhounds, Kink, Nemo & Speckles (pictured), and we usually have a foster hound or two. I could not imagine life without my coonhounds. If you are looking for that perfect companion, then a coonhound may just be the dog for you.